Find information on Museum and Ca' d'Zan Admission and Tours including Private Places, Art After 5 and 3 Day Passes. Join us for a variety of programs for families at The Ringling! With Family Saturdays, ROAR!, and Stroller Tours, there is something for all ages. Our Gallery Walk & Talks, ViewPoint Lectures, Collecting Recollections and Conversations are stimulating and informative. At sunset, a sophisticated system of LED lights changes the color of the space. Gaze up at the sky through the 24 foot square aperture, and contemplate light and perception. 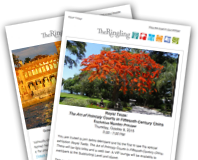 The Ringling offers a variety of special events for you to experience including the Turrell Skyspace, Ringling by the Bay, Ringling Underground, and more.